This Month On The Homestead: Turkeys, Foxes, And A Fisher Cat! 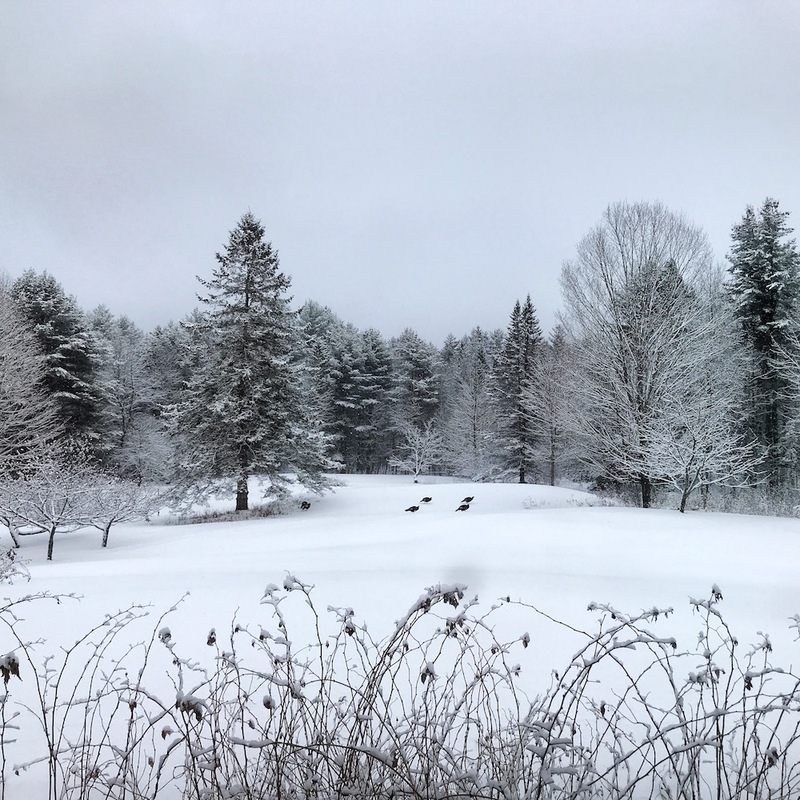 It’s tempting to say that January is a barren, desolate time of year here in Vermont. But it’s not. Not really, anyway. And not if you’re attuned to the ever-present, ever-changing ecosystem of life that populates our woods. True, we’re shrouded in snow. True, we have more ice than greenery. True, some critters are hibernating. Equally true is the shimmering beauty of sun on snow and the exhilaration of inhaling frigid air while snowshoeing and the unparalleled comfort offered up by our cozy woodstove. All in all, January and I are on good terms. And why not? Complaining about the weather is among the more futile, pointless exercises one can partake in and you know I hate pointless exercises. Rather, I prefer to embrace this season of semi-dormancy and sub-zero temperatures. Everything in life is fleeting; weather claims no special exclusion. If you’re just tuning in, this is a recurring series in which I document each month of our lives out here on our 66-acre Vermont homestead. After leaving urban Cambridge, MA in May 2016 to chart this wholly different life, we’re experiencing a constant learning curve of exploration (and plenty of stupid novice moments). Check out last month’s installment here and enjoy the best and worst (ok, mostly the worst) moments of our first year on the homestead here. Wondering if it’s less expensive to live rurally? 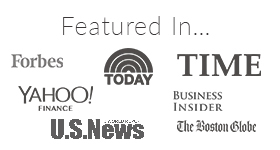 Check out: City vs. Country: Which Is Cheaper? The Ultimate Cost Of Living Showdown. I have to start us off with the most hilarious happening of the month: turkeys. This saga began when Mr. Frugalwoods and I noticed two hulking silhouettes careening across our lower field. The back of our house is almost entirely windows (great for views; not so much for energy efficiency… ) and our yard slopes gently down from the house, which provides an ideal viewshed for monitoring the weather and the critters. We actually sit next to each other–as opposed to across from each other–at the dining room table so we can gaze out our big picture window together. At any rate, it was while gazing out this window that we sighted these two large turkeys making camp underneath one of our apple trees. At first, there were just the two of them and they meandered around the yard, poking their beaks into everything of interest. After a few days, however, word got out on the turkey grapevine and an entire flock decided to make our yard their winter retreat. We are truly grateful because these beasts are absurd to watch. Have you ever seen a wild turkey in action? Easily the most awkward birds. In the world. I mean, they can’t fly well, they can’t walk well, and they can’t run well. They’re essentially oversized, feathered footballs perched atop precariously spindly legs with an inability to launch into flight without bumping along the ground first. How they survive in the midst of our panoply of coyotes and other predators is honestly beyond me. I’ve never seen an animal so inefficient at moving its own body! Needless to say, we get a lot of mileage out of watching our flock traverse the yard every day. They nose around in our apple trees trying to scam leftover goods and root in our dormant berry bushes, seeming to find enough sustenance based on their rotund constitutions. Having decided we’re not a threat, the turkeys now venture quite close to the house and eyeball us through the window, as curious about our foreign way of life as we are of theirs. The other morning, Babywoods announced, “there’s an animal out there!” and sure enough, several turkeys were craning their accordion necks to peer unrepentantly through our living room window. Lest you think turkeys are our only wintertime fauna, let me tell you, we’ve been visited by a fisher cat! Neither a cat nor a fisher, the fisher is a sort of large, furry weasel that’s often described as elusive and not a fan of being seen. Hence, we didn’t actually see this fisher in person but rather through the technology of our wildlife camera. Photo at right! In addition to these actual animals, we’ve made a hobby of noting all the splendid and varied critter tracks that dot the snowy landscape. Snow provides an excellent log book of everything that has waltzed by! So far, we’ve documented about 10,000 turkey tracks, fox feet, snowshoe hare tracks, coyote, and grouse. We spotted said grouse out the window once, but she was wary of us and much more agile than the turkeys (wouldn’t take much, to be honest… ), so no photo. Getting outside on a daily, or near-daily basis, remains a priority for our little fam and the weather’s been perfect for snowshoeing! Babywoods likes to walk for, oh, about the first minute of our hikes and then hops into her game sled to be pulled behind us. We traverse our woods scoping out critter tracks, frozen creeks, and fresh snow in our snowshoes. At 38 weeks pregnant, I find I can still snowshoe as long as my pace is slow and my breaks frequent! 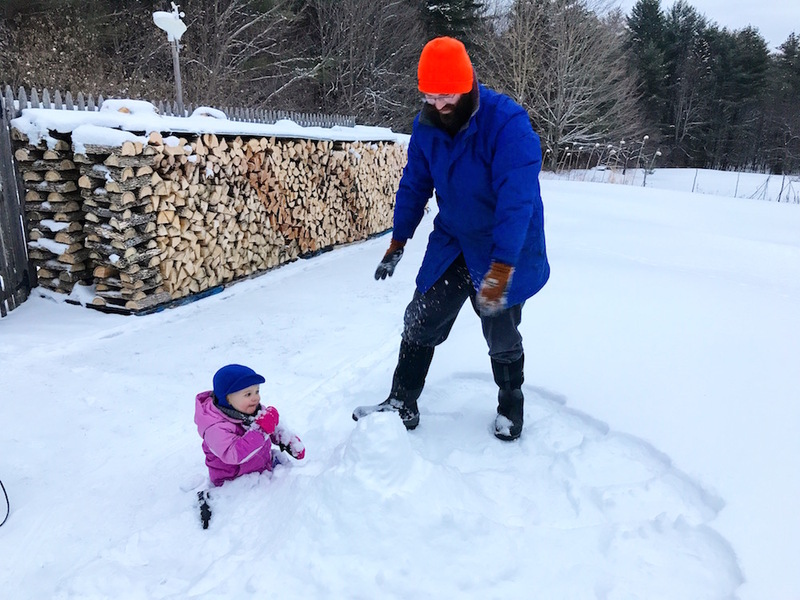 Babywoods has a burgeoning interest in playing in the snow and so we’ve built “snowmen,” which are really just piles of snow on account of how icy the snow’s been and how unwilling it is to roll into proper snowman-shaped balls. No matter, she loves her snow piles and hugs them “to keep them warm.” She’s also a fan of snowball fights, which entails her picking up loose snow and then mostly flinging it back onto herself. In a feat of engineering, Mr. FW and Babywoods built a little snow cave with three walls and a ceiling. She informed us that it needed a door and a blanket, but was otherwise sufficient for her needs. Yep. This title pretty much sums it up. Mr. FW moved some more wood onto our porch. 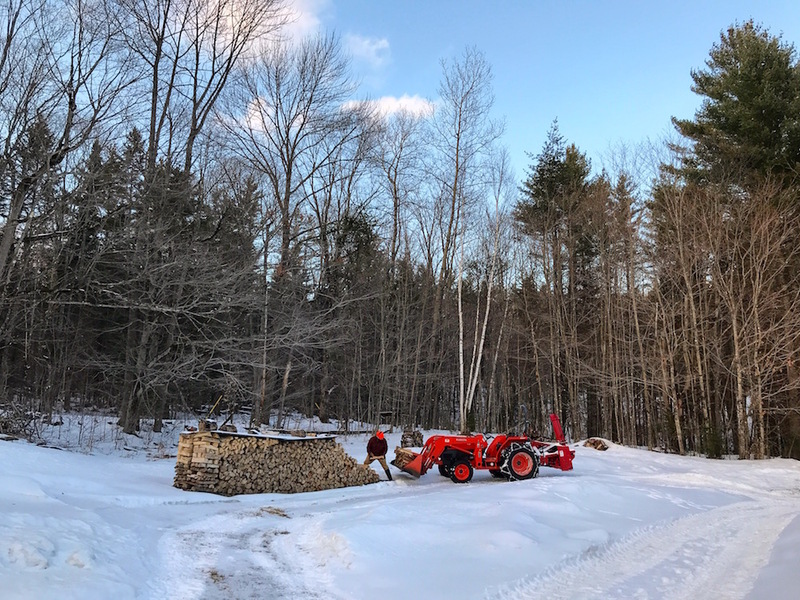 Ok twist my arm and I’ll elaborate… We heat our home with our wood stove, in which we burn wood we harvest from our land (and by “we” I mean lumberjack Mr. FW). Said wood must follow a several step process before it makes its woody way into the wood stove to be burned for heat. It must first be chopped down (it does start life as a tree, after all), then it must be bucked into log rounds, next it must be split into firewood-like shapes, then stacked in a woodpile, allowed to dry for many months and then… moved onto the wood racks Mr. FW built on our back porch! The final step is for Mr. FW to wheel our handy-dandy homemade woodbox onto the porch, load it with wood, promptly return to the indoors, and load up the stove. Voila! Heating with wood. 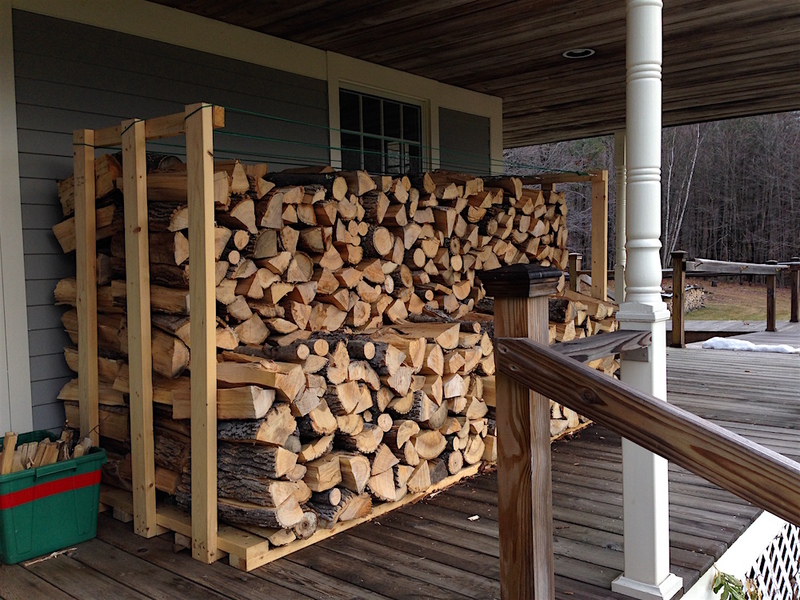 The wood racks on our back porch hold 1.5 cords worth and we’d burned about a cord so far this winter. Given this depletion in our porch supply, on a particularly balmy January day, he got out there and reloaded the rack with a cord of wood from our “wood playground,” which is to say the many scattered piles of wood we have hanging out around our property. We do not, as you might’ve surmised, have a woodshed, which is the reason for our many and varied woodpiles. It is, as you might’ve surmised, very high on Mr. FW’s summertime to-do list to built a woodshed to house all of this varied and sundry wood. But the random piles suffice. And now, we are stocked up with another full cord and a half on our porch racks, accessed quite easily via the french doors in our living room, conveniently located right next to our wood stove. All very civilized indeed. 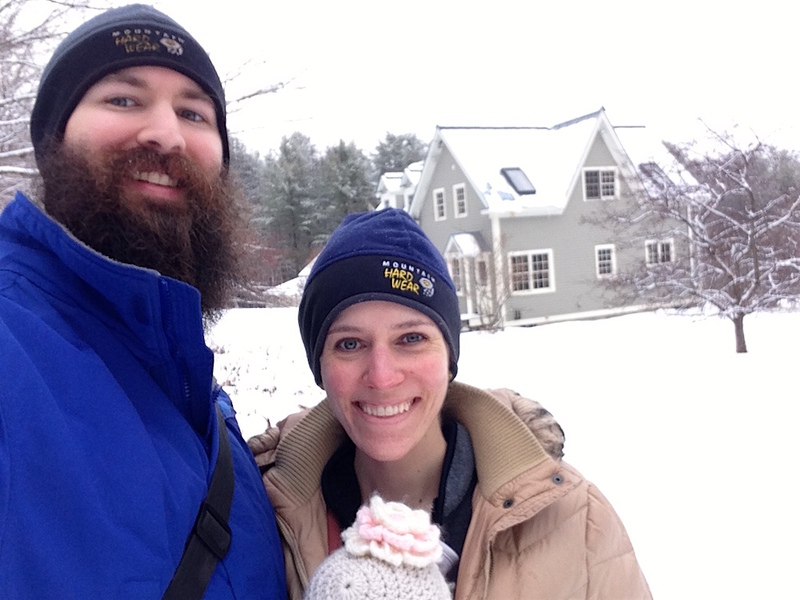 January 2016: the day we closed on our homestead! I’d be remiss if I didn’t point out that January marked the second anniversary of us closing on our homestead! Lo those two years ago, we trekked up to Vermont with a teeny, tiny baby and a hound in tow to close on what we hoped would be our dream-come-true homestead. This place, these woods, the people in our community–all of it has far exceeded our expectations and we are thankful every day that we get to live here! I will tell you that the day we closed on our homestead was actually quite a bit more traumatic/full of drama than these sentences belie. It’s a story I tell in great detail in a chapter in my forthcoming book, which is now available to be pre-ordered (for which I will mail you a signed bookplate!). Check out this post for all the details. Not to leave you with a cliffhanger, but I really can’t write it any better than I did in the book! While I only document homestead life once a month here on the blog, I post photos to Instagram and updates to Facebook with much greater regularity–usually daily! 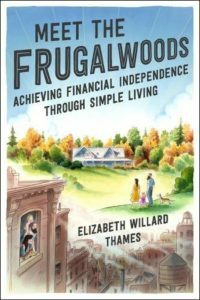 Join me there if you want more of our frugal woods. Onward to February, frugal comrades! How was January on your own personal homestead? I can’t believe you guys have been homesteading for two years- wow! My relatives live in New England and have trouble with fisher cats trying to rob them of their chickens! I like the wildlife camera you have… my husband and I always find tracks across the snow on our land and while we can identify some of the animals they belong to, we are curious to figure out the mystery tracks! You are in our thoughts & prayers as you get closer to welcoming Babywoods #2 sometime soon! Wow, two years with the homestead. Congrats, and I can’t wait to read all about it in the book! We took advantage of the long weekend and headed up north. On the way back we spotted a flock of wild turkeys and a couple of bald eagles! I love wildlife, it was so exciting (even though I’ve seen both or these animals before). I’m glad to hear I’m not the only one who can watch turkeys awkward antics for hours! Awesome, love the wildlife cam photo. I should get one of those! Regarding the beginning of the post and your weather, the very reason that most people would complain about Vermont weather is the reason I want to move up that way. I’ll take a 10 degree day anytime! I love having 4 seasons but where I’m at here in DC we just now get unbearable summers, and barely any winter. I’ll never understand people who don’t like a 32 degree day in winter, but are okay with two weeks of 97 degrees and 99% humidity in summer (with endless mosquitoes). Our summers here are intolerable and miserable. You’re just confined to 24 x 7 sweating and misery. What a great attitude!! I have the same thankfulness but I’m a city slicker living in Philly. 🙂 I l find that the hustle and bustle of the big city is always interesting. A good part of my thankfulness comes from the fact that I’m FIREd because I that allows me to spend a lot of time “playing” in our fair city. We beat mostly with wood, too, and say we have propane as a backup. Dh was out splitting wood on New Year’s,and had an accident with the wood splitter. An ambulance ride and emergency room visit later,and he won’t be splitting wood for the rest of the season. Fortunately we have enough for this year and probably most of next. He’s been splitting wood for years with never a problem but it has made us rethink our strategy a bit. I love watching the turkeys. On day last summer I was driving by some woods and out came a bunch of baby turkeys and a few adults with them. It took them awhile to cross the road. Oh how scary! I hope he’s ok! Haha, it is totally a Ferret of Unusual Size!! WHERE IS LITTLEWOODS!? I saw you had a new post… I’m on baby watch here (I know I’m sad and maybe slightly pathetic, but it is what it is! )… you must surely be due around… soon? Your homestead looks like a little patch of paradise – I’m in drought-stricken, hot, windy Cape Town and am naturally more of a cold weather person, so I truly envy your beautiful winters. You’re so right! Turkeys are hilarious little critters. I had a cousin who raised Rio Grande show turkeys (I kid you not; a SHOW turkey). They’re funny and each have such a personality. Truly, the wild turkey is the most unlikely thing to take wing since the spruce goose. In flight they look like feathered bowling balls hurtling through the air against all odds. I wonder if Mr. FW has considered making a modular wood rack system using pallets as a base with 2×4 sides & top. Since you already have the pallet forks you (I mean he) could move firewood on pallets from your future woodshed and directly on to the porch. I can’t tell how close the tractor could get to the porch, but it doesn’t look like you have a railing there to worry about knocking over. Loading and unloading the front-end loader bucket by hand is a lot of work. That’s a great idea! Thank you! I will pass it along to him! He’s working on designing the woodshed now, so this is perfect timing. I LOVE your good-natured take on the weather. Complaining about the inevitable is truly one of my pet peeves. They say there’s no such thing as bad weather, only bad clothing choices. 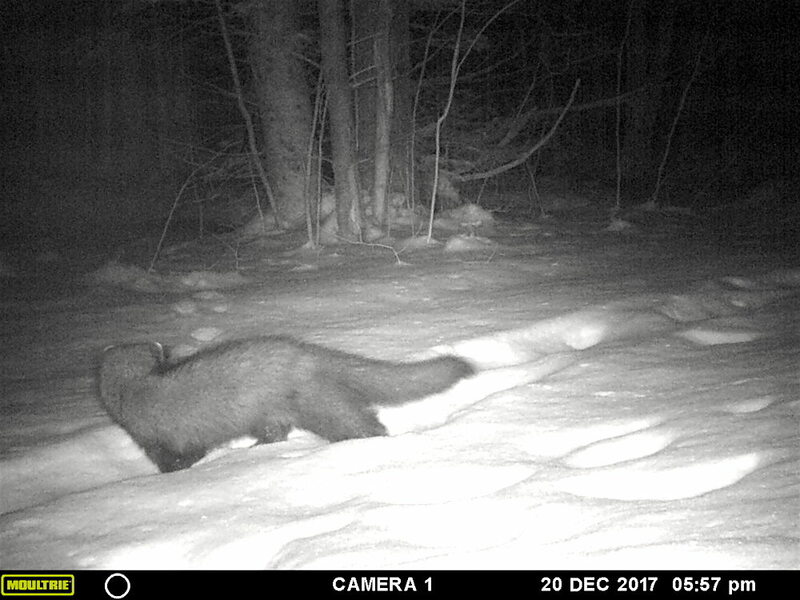 I’ve never actually seen a fisher cat (only heard of them as they’re a local hockey team’s mascot) so it was very cool to get a glimpse on your animal cam! 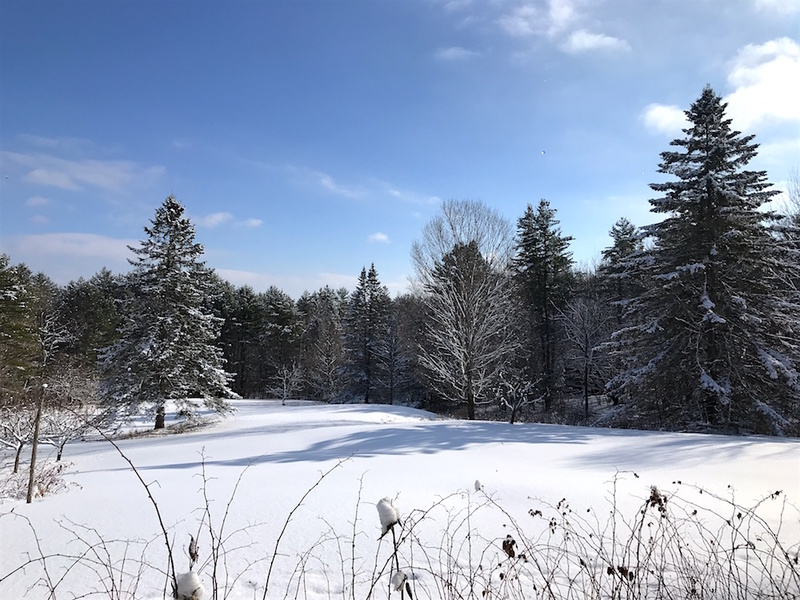 I agree with you, January and February can be some of my favorite months because the snow is just beautiful in New England. I don’t think I’ll ever get tired of waking up to trees blanketed in fresh snow (shoveling it, yes. Looking at it, no). I’d never even heard of a fisher cat! (Obviously I’ve only really lived in the city!) What a weird-looking animal! And I must let you know, you guys are inspiring us to get out more (a LOT more) this winter than we ever did in the past, and it’s been good for us. Granted, we don’t get out every day like you guys, but I’d say we’re out doing something around 5 days a week, which is a pretty vast improvement! Also, I can’t wait for your book to come out. Being a rather frugal person myself, I try not to buy too many books, but I just wrote a blog post about my “rules” for book buying, and my 3rd and last rule for if I’ll buy a book or not is if I want to personally support the author with my dollars (usually because I know them in person or because they’re a blogger I’ve learned a lot from). You’ve been such an inspiration to us, and so I am all too happy to show you how much I appreciate all you’ve done by buying your book (which I’m also excited to read, of course!). Gosh, there’s a lot that one might envy in the life you’ve built, but I think I am most envious of your ability to go snowshoeing at 38 weeks pregnant 😉 I’m at 38 weeks myself and I can barely walk! The wild turkeys are too funny. A few weeks ago my husband and I were driving out of our neighborhood when one burst across the street in front of us! It was rather startling at the time, since they’re so big and clumsy. OMG I’ve been waiting for your new post the whole day today! I check your blog almost everyday in the morning hoping for a new post. Congrats on the 2nd homesteading anniversary! I remember that day when you announced that you both were moving to Vermont. Time flies! Whenever I read your homestead series, I’d fantasize about that one day when Mr. FAF and I move to a homestead ourselves. Frugality helps us stay on track! So happy to read your post, because among other things, it reminded me that I had taken photo of animal tracks in the snow. They were of course deer tracks (we live about 30 miles north of NYC). Your post reminded me to look that up. Congrats on your second homestead anniversary. Hope we hear news soon of the arrival of the new addition to the family. Praying it is an easy birth and wonderful healthy girl. We are having a city anniversary, having reached the one year mark on the purchase of our circa1904 home. Oddly enough, we have a tribe of wild turkeys that roam the neighborhood and frequently saunter across our lawn. They even have their own Facebook page, Northeast Minneapolis Turkeys. I kid you not. 🙂 Love hearing your homestead stories. Wow, congrats on your two years on the homestead! I actually find this wildlife observation really interesting. Being so used to how many similarities there are between Europe and America, it is fun to be reminded of how different the flora and fauna can be! Turkeys and fisher cats, and they are so large! Actually turkeys can run quite fast and nimbly, you would be very surprised once they are on hard dry gound. (We all seem to flounder a bit in the snow!) I think if Babywoods actually ever got close enough to think she could grab for a turkey’s hand (awww…) you would see it run pretty well! We have a flock of wild turkeys living in our (comparatively urban) neighborhood. They can get quite menacing. But you’re right, they are funny to watch. I think we’ve got a couple of toms, some hens, and a few poults. The ones I saw Sunday afternoon looked like teenage toms. They were crisscrossing the street and getting traffic all balled up. I really enjoy that you blog! I love to sit with my morning coffee and read your entertaining articles! I feel as though we are old friends having a morning coffee chat. Your style of writing is comforting. I was laughing out loud of your depiction of the wild turkeys! Who knows, baby woods might grow up to be a wild life park ranger 🙂 A Fisher cat? Never heard of them…we had Panthers when I grew up in the country but then again we did not have cameras to capture the night crawlers. I just wanted to tell you that a post you wrote about enjoying life in every season by wearing the right clothes. We are now in a financial position to do so. I am pouncing these winter clearance for warm rain boots, windbreaker, wool socks and gloves. In the summer clearance I will buy hiking boots and breathable hiking clothing. I wouldn’t have known to do it( I know, common sense but I had just made do. Not anymore.) unless you had this blog, so thanks! Thank you so much! And, glad to hear you’re getting the right gear–makes such a difference in being able to enjoy all weather. Have fun :)! I love how you find the beauty in winter! Coming from Minnesota, winter is one of my favorite seasons. It is always such a bummer when people get down on it instead of embracing the weather! Can’t wait for your book to come out! A family member preordered the book for me as a Christmas gift. I’ve been counting down to its release. I live off the grid in a quarry that was first used to build a spill-over dam meant for the “water works” here in Council Grove. That was the eighteen nineties. It was used again in the thirties as a source of rip-rap along the road to our city lake. The quarrymen covered it all back up when they were finished and a two acre woodlot of Walnut, Hackberry, and Black Locust colonized it. I’m “county” meaning my 200 square foot travel trailer doesn’t have to comply with any of the proliferating city ordnances. I haven’t been this happy since I was seven years old. I have the Nuthatches, Chickadees, and Fox Squirrels by day and the game cameras monitor the Red Fox, Barred Owl, Racoon, and even the occasional pack of Coyotes who wake me up and give me goosebumps. Some of the Futurists claim we’ll ultimately all be city dwellers. They don’t know us very well. 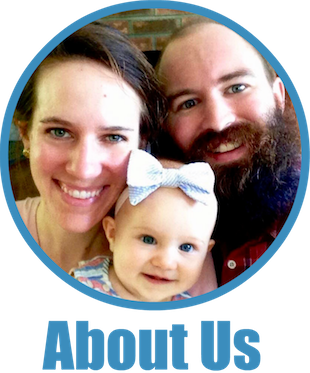 It has been amazing following your exploits with the homestead. Thanks for sharing everything and thanks for the inspiration. Wow, that Fisher Cat is spectacular! Wow! I love seeing your photos. Living in a place where no snow exists and I barely own a winter jacket its so warm, I especially look forward to hearing about your winfer shenanigans! Love reading your updates on homesteading…must note that I miss living out in the country and find this a good reminder of the joys and thrills of living very close to nature. Cheers. Love the amount of snow you get out there in Vermont! In the south of England we rarely get snow and then usually only for a few days. However we do have loads of foxes that come right into the towns and badgers, but no wild turkeys (they sound like fun). The foxes are really bold and curious and often follow me and my dog when we go for evening walks around the block. Love reading your blog and your writing style, its really entertaining with a real peaceful ethos to it. Thanks. It’s interesting reading about how outdoors your life is in the winter snow. Whenever we talk about our plan to leave California for Michigan we get horrified looks and dire warnings about the winter. The truth is when it’s 110 degrees for several months straight, it’s actually a lot more limiting than just strapping on the right gear and heading outside. Give me that fresh clear air of winter any day! I find I want to move in the cold whereas the makes everything feel like too much effort.